Come visit us at one of our FSMDB branch locations throughout the FSM. Apply for HELP to make your home more energy efficient. FSMDB has helped hundreds of businesses throughout the FSM. Whether you’re just getting started or ready to grow, we can help! The FSMDB offers Business Lines of Credit to businesses that have been operating for at least two years. Whether you need to purchase a new car, a new boat, an engine, or assist with a family emergency, FSMDB Consumer Loans can help. FSMDB offers a Home Energy Loan Program (HELP) to help customers make their homes more energy efficient. Find out more! With offices conveniently located in Kosrae, Pohnpei, Chuuk and Yap, we are always available to help. Come visit! FSMDB is Your Partner in Business.Visit any of our branches for more information. The Federated States of Micronesia Development Bank (FSMDB) was established by the 1st Congress of the Federated States of Micronesia in 1979. Its operation began on October 1, 1980, but lending did not start until 1982. In 1994, the enabling law that created the bank was amended to reorganize the structure of the bank to reflect that of a normal corporation with shareholders. The bank’s current shareholders are the FSM National, Chuuk State and Kosrae State governments. The primary purpose of the bank is to provide loans for the economic development of the FSM. The bank has its headquarters located in the State of Pohnpei, the Nation’s Capital, with branch offices in Yap, Chuuk and Kosrae. What Services does FSMDB Offer? FSMDB primarily offers loans to commercially viable projects that are owned by FSM citizens and foreign companies with at least 25 % FSM citizen ownership. FSMDB currently offers: 1) Business Commercial Loans; 2) Home or Housing Loans and 3) Personal/Consumer loans. 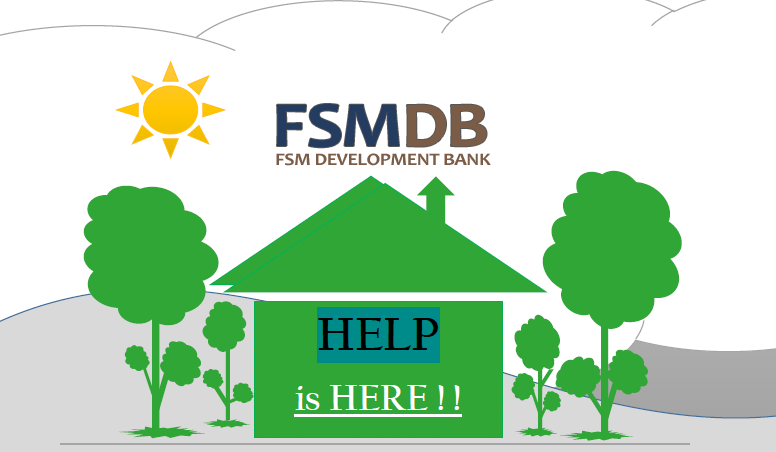 How Can I Contact an FSMDB Official? FSMDB Headquarters are located in Pohnpei, the Nation’s Capitol. FSMDB also supports branch offices in the FSM states of Kosrae, Chuuk, and Yap. Please feel free to contact us with any questions regarding our products and services. Applications for Business Term Loans, Business Lines of Credit, Consumer Loans, Housing Loans, or Home Energy Loans, can all be downloaded online. If you have any questions regarding the details or eligibility of any of our loans, please visit a branch location or contact us. Questions about FSMDB services? Considering a personal or business loan? Please feel free to visit one of our branch offices, or contact us using this form.